The Band and Orchestra had a combined concert for their 4th grade students on Thursday, January 11th at 7pm at Hufford Junior High School. 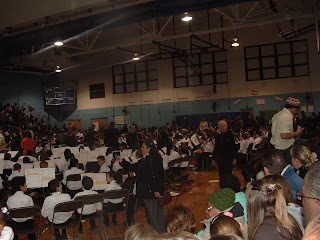 All of the Joliet 86 District 4th graders in Band and Orchestra were there. It was a packed house. I was standing near the end of the bleachers (with my 4 other kids) with a group of about 25 other people. It was hot. We were tired. Oh, and did I mention that I held Jimmy the whole 90 minutes that we were there? That was fun. Jacob did very well. 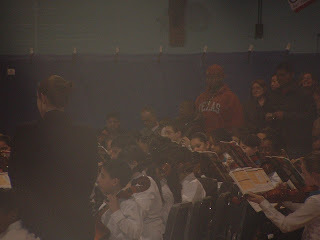 The parents were all in the gym, and at about 6:45, they marched all the students into the gym. There were 4 or 5 Band Directores, and 4 or 5 Orchestra Directors. They took turns between Orchestra and Band, and between directors. They played about 8 songs a piece. Then they had awards for Merit. Jacob got one. Good job Jacob! 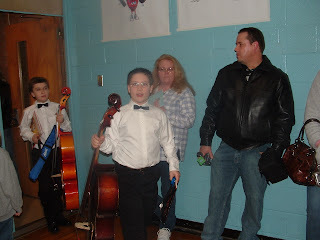 In these pictures, obviously you can see Jacob coming into the gym carring his instrument. The other pics are of the concert. The one, I've zoomed in. It's fuzzy, but you can see him. The other, you can see part of his head, and the top of his cello. He's off to the right. It's a streatch, but he's there.